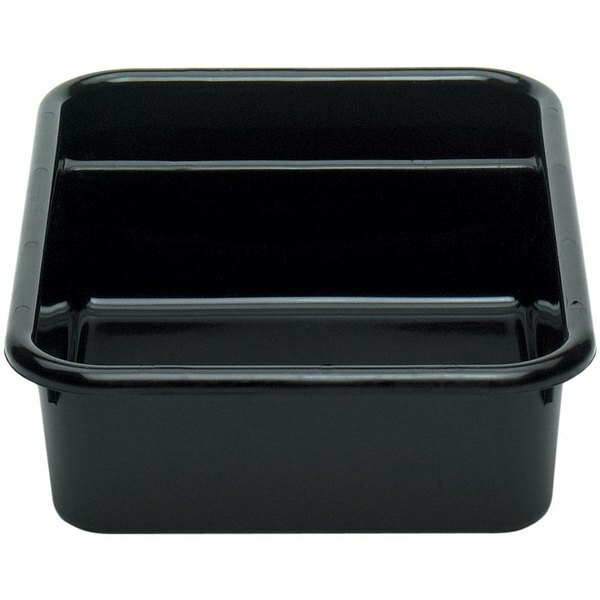 Make bussing your tables a breeze with this Cambro 1621CBR110 Regal Cambox black plastic bus box! Perfect for the everyday operations of your restaurant or cafeteria, this bus box is an efficient way to clean up your dining area, allowing you to transport dirty dishes, glassware, and other items from the table back to the kitchen with ease. Boasting a classic black design and a durable, ABS construction, this bus box is both stain- and scratch-resistant to ensure long-lasting reliability. Plus, its rigid construction stands up to heavy loads and rough handling, making it ideal for constant use in any busy establishment. Thanks to its overhanging edge, this bus box is easy to carry from your dining area to your warewashing area as you clear tables for new customers. It also has rounded corners that make it simple to clean in between uses or after a busy dinner service. For added convenience, this bus box won't stick together when it's stacked with other bus boxes of the same size (sold separately), allowing your staff to grab it quickly when it's needed. Plus, its two compartments aid in organizing your dirty dinnerware and help prevent chipping of china or glassware. Whether your staff uses it for bussing tables, storage, or transporting goods, this bus box is a versatile addition to any food service operation! This amazingly durable brnad name bus bin is a must have for every professional kitchen. The silverware seperation is a great thing to have on a busy night.